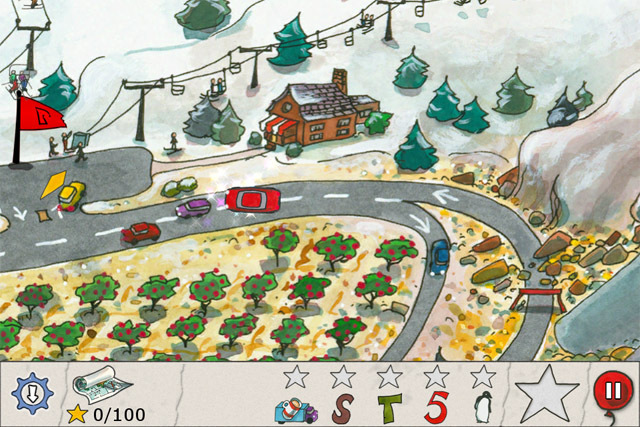 “Roxie’s a-MAZE-ing Vacation Adventure” for the iPad was ready in April. We quickly sold in more than 70 countries and was awarded with “New and Noteworthy,” “What’s Hot,” and “Staff Favorite” in many itunes stores around the globe. 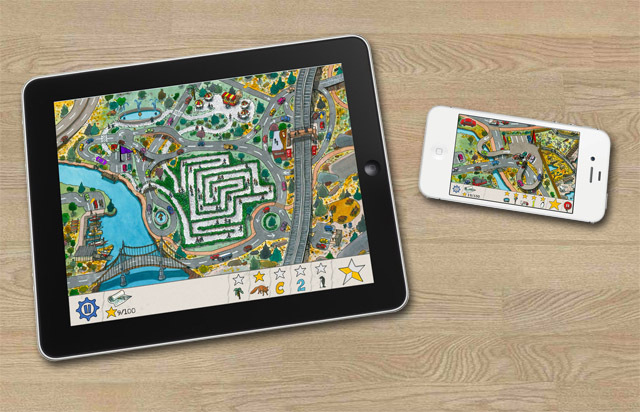 We always had the iphone in the back of our minds but a-MAZE-ing was developed for the big screen ipad, so in August we decided to give the iphone version a try. A lot of people have asked us for it. So we first had to figure out how we could translate this huge maze onto a much smaller screen. We knew we couldn’t keep the same screen size as the ipad – the details would be much too small. Our gameplay requires that you move from one to page to another, but each page was much too big. The first thing we tried was to keep the car centered and move the maze. The car would be the correct size for a “small” finger. This would define the size of the maze behind the car. On the original ipad we have 16 different screens where you have to drive, fly, ski and raft your way around the maze and find a lot of things during your trip. On the iphone we divided each screen in 4 pieces – the iphone has a different screen resolution and a different aspect ratio than the ipad. Here the first real big difference started to appear: the iphone 4 has almost the same screen resolution as the ipad but much smaller screen, called the Retina screen. Our iphone app requires double the resolution from the ipad because we are zoomed in much more. There is the iphone 4(s) with the Retina screen, but there is also the iphone 3G and 3GS. The older iphone has only 25% of iPhone 4 screen resolution, but you need to support this iphone to because a lot of people are still using the iPhone 3GS. So internally the iphone version has different screens for the different phones. Another big problem for us was the difference of internal memory on the different iphones – the iphone 4 has 512 mb, the 3GS 256 mb and the 3G 128mb, so we had to change a lot to compensate for these differences. Since the screen size is limited, we also had to figure out what to do with the menu on our screens. This menu shows the things you have to find, and some buttons. It took us a while to figure out the best size for the menu and keep the search items recognizable. Still the menu took a lot of screen space, so we decided that you could hide the menu and keep the maze full screen. 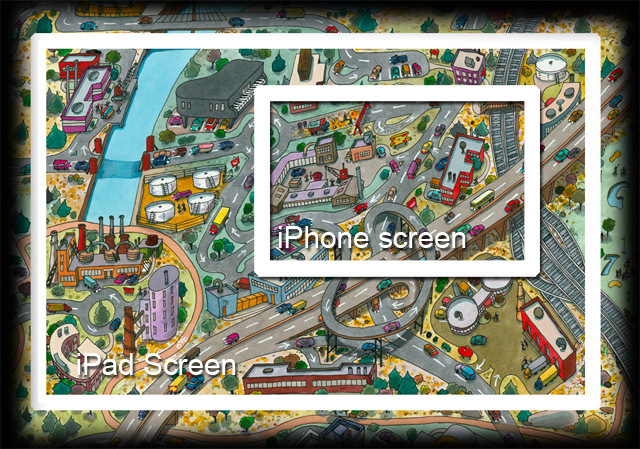 This way we could also add a zoom-in and zoom-out, a much requested feature from the ipad version. On the iphone you drive around, but you can also pan around because a lot of the things you have to find are away from the main roads. This generated another problem, how to get back to your car. When you move around looking for hidden items you will find a small car icon on the top-left corner which brings you directly back to your car. This also gives you an excellent way to always find your car quickly. So it took us a couple of months, together with a dozen other projects, to finish the iphone version. I hope you enjoyed reading our making of and our apps.